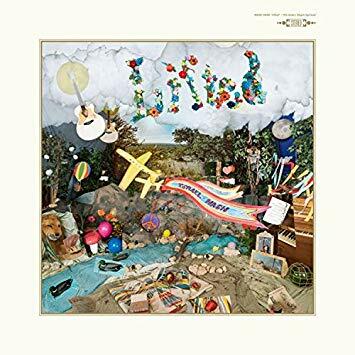 If ever there was an apt title, Lifted, the name of Israel Nash‘s fifth album is exactly that. If his last outing, 2015’s Silver Season, was a rather more downbeat (yet equally gorgeous) affair, focusing on themes of destruction, devastation and frustration, then Lifted is a spiritual reawakening of the senses. Picture the scene – you’ve just finished work (or college), either for good or for a lengthy holiday. You have no plans whatsoever. The weather is perfect and you are basically an aimless wanderer for the next month or so. That feeling of not having to commit to anything or anyone, and just being able to drift along in whatever the hell way you damn well want to, is the overriding ambience you get from Nash’s new record. Oh, and in this musical Utopia, I’m pretty sure you’re near a beautiful sandy beach too, perhaps a deserted one, whatever stresses you once had now at the bottom of that bright blue ocean, having been washed away with the gently crashing waves. Sound good? Of course, it does – this is Israel Nash we’re talking about here, and as you should know by now, this is a man who never lets us down. So here are 10 new songs (12 if we’re being pedantic, but two of those are merely intros to the main compositions) that sweetly lap at your toes like a favourite labrador while you’re busy dreaming in your deluxe deckchair. As usual, the pedal steel is used to ravishing effect on gigantic, lush sounding arrangements like ‘Rolling On‘ and ‘Looking Glass‘, before we reach the more upbeat, but still resoundingly ravishing ‘Lucky Ones‘, Nash having now honed his craft to the extent that he is writing songs that sound like they could have come from the pen of either Cat Stevens or Brian Wilson. And they’re up the with the best work of both, which goes some way to giving you an idea of just how important an artist the Texan has now become. ‘Sweet Springs‘ even has a faint whiff of Roy Wood about it, a bit like the former Wizzard man if he was being backed by The Beach Boys, while ‘SpiritFalls‘, in its verses, recalls R.E.M.‘s ‘Bang And Blame‘ to some extent, perhaps even mixed in with the ethos of Peter Gabriel, but this is the great thing about an Israel Nash album – they’re never so obvious that you can pin it down to just one or two influences. Obviously, there’s still the Neil Young thing going on in there too, especially on the more minimalistic ‘Strong Was The Night‘, and definite nods to Roy Harper too, but Nash’s not inconsiderable idiosyncrasies make Lifted an album all of his own. Israel Nash has never released a more huge sounding record than this, and it seems to suit him perfectly. In a perfect world, such as the one you find yourself in as it plays, it would be huge. Lifted is released on 27th July through Loose Music.